SEATTLE, Wa. (WABC) -- Washington state health officials say they have found no source for the E. coli outbreak related to Chipotle and the chain's Pacific Northwest restaurants could reopen later this week. Washington state epidemiologist Dr. Scott Lindquist says all the tests of food from Chipotle stores in Washington and Oregon came back negative for E. coli. Chipotle did its own testing, and those results came back negative as well. Lindquist says the Chipotle restaurants in Washington and Oregon will be allowed to reopen after they have met some conditions. They must get rid of and replace all produce, do a deep cleaning of their stores, pass a local health inspection and start a new protocol for cleaning produce. Lindquist said he expects Chipotle will reopen the 43 restaurants it closed in Washington and Oregon by Wednesday or Thursday. 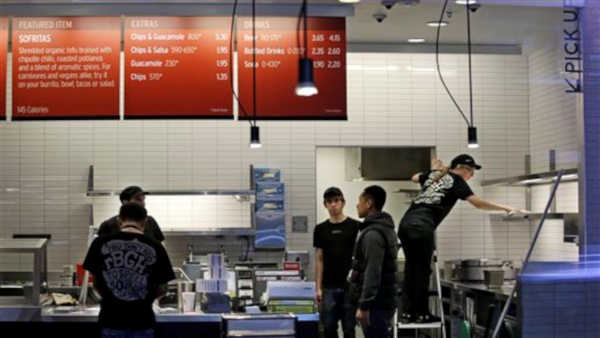 About 40 people in the Northwest have gotten E. coli in the outbreak associated with Chipotle.